With over 39 years experience, we offer a full design, build and installation service for businesses and individuals across the UK. Whether you’re looking for a simple exhibition system produced and delivered or set-up as well, a custom built stand for a one off show or something to re-use on multiple occasions, we’re the company you can trust to get it right, every time. Our comprehensive and flexible graphic design services will help you stand out from the crowd; with highly competitive pricing, fast turnarounds and the ability to meet any requirement, our graphic designers will ensure that your images capture your audience’s imagination. Here at Blue Creation we're specialists in custom exhibition graphics, printed pop-up stands, and an extensive variety of banner stands, roller banners, flags and pop-up display systems. Contact us for a quote today. Professional exhibition stand production and installation is an essential part of our business. 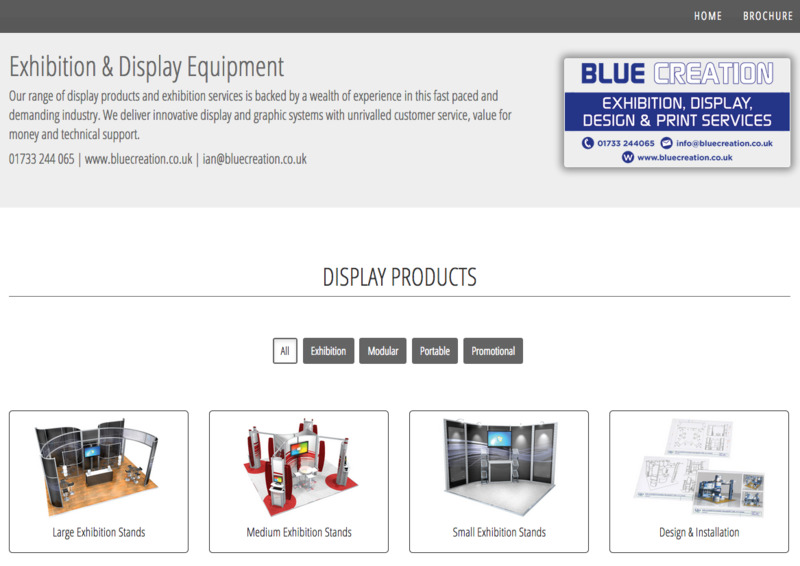 When you purchase exhibition stands from Blue Creation you can be confident of the highest standards of quality and service, alongside our unrivalled experience and expertise. 16th October 2016 by Matt in Uncategorised | Comments Off on Welcome to our new website! Welcome to the brand new website of Blue Creation! We are a leading provider of exhibition and display solutions offering high quality products from banners and pop ups to fully installed exhibition stands. Have a browse at all of our display solutions we have available. We pride ourselves on our ability to meet all budgets and our great customer service with quick turnarounds mean that we guarantee to meet your deadline – every time!. Our reputation is based on quality, service and unbeatable pricing and with all of our services being under one roof we’re able to give you the widest choice of display solutions in the UK. Click here to contact us for a no-obligation quote or call 01733 244065 today.